LOS ANGELES — Art and gentrification have a long and complicated relationship. The arrival of galleries and artists’ studios to a neighborhood is often the first step in successive waves of disruption as boutiques, high-end restaurants, and condos follow. Long-term residents are displaced as rents rise in these newly desirable areas. As reported in Artnet, a new study titled “Quantifying the link between art and property prices in urban neighborhoods” illustrates a correlation between high concentrations of images tagged with #art on photo-sharing site Flickr and areas with increases in property value. Regardless of artists’ intentions, politics, or personal finances, their arrival in a previously undeveloped neighborhood can signal big changes for their new neighbors. This scenario is playing out in emerging arts districts around the world, and Los Angeles, with its current artistic renaissance, is no exception. Communities on the city’s east side are feeling especially squeezed by development, as half a dozen high-profile galleries and several other smaller spaces have sprung up in the past few years along the LA River. 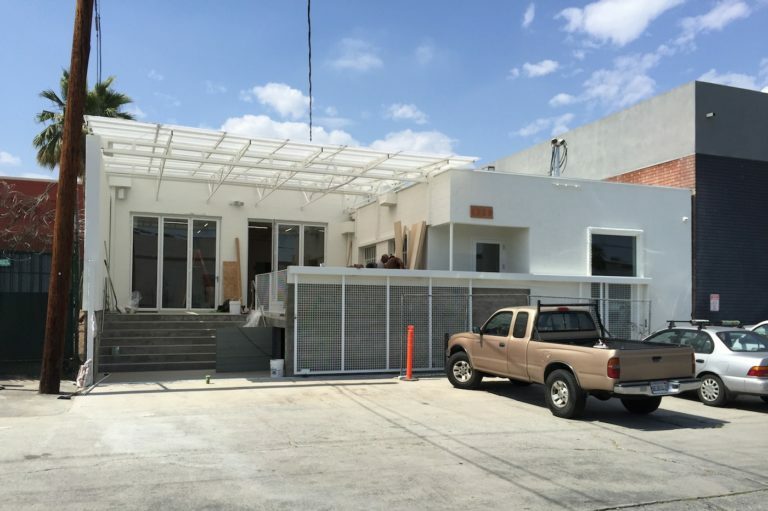 The latest flashpoint is PSSST, a 5,000-square-foot nonprofit arts space located in the predominantly Latino neighborhood of Boyle Heights. According to its statement of purpose, “PSSST is founded on the principle of artists supporting artists […] PSSST invests in artists by valuing process over product and community over singular success. PSSST actively works with underrepresented artists—women, people of color, and LGBTQ-identified.” Despite its seemingly progressive mission, PSSST has recently received strong opposition from activists both within and outside the Boyle Heights community, some calling for increased dialogue with community groups, while others simply want the space gone. PSSST founders Jules Gimbrone and Barnett Cohen had intended to open their spaceon Friday, May 13, but postponed it due to a request they received from a group calledPissst and Resisting, which “came together to question the ideological claims and financial interests of PSSST,” according to an email they sent to Hyperallergic. Pissst and Resisting had drafted and circulated a “fact sheet” about PSSST that called into question the space’s financial motives, commitment to the community, and board’s art world connections. Specifically, Pissst and Resisting took issue with the fact that the building where PSSST is located was purchased by a silent investor for almost a million dollars in August of 2014, who agreed not to charge them rent for five years. (This agreement was recently extended to 20 years as a sign of good faith by the investor, provided they adhere to their nonprofit by-laws.) Pissst and Resisting suspect the real motivation of the secret investor to be real estate speculation, stating in their fact sheet: “There is no way to know the true intentions of the space without knowing who has put money on the line.” That Gimbrone, being an artist and educator, received a real estate license in 2014 did little to assuage their fears. On Monday, May 9, a meeting was held at Union de Vecinos, “an organization of neighborhood committees,” where a letter was drafted “demanding [that PSSST] postpone [their] VIP preview on May 12th and [their] public opening on Friday May 13th until after you have met with our coalition.” According to a statement released by Gimbrone and Cohen, they agreed to postpone their opening, suggesting three dates later that week to meet; however, the coalition said this was not enough time to notify all the local residents. The various dissenting groups organized a protest that was held in front of the space on Friday, May 13 to coincide with the original date of PSSST’s opening, during which feces were thrown at the building, according to Cohen and Gimbrone. Instead of the dialogue that had been called for in the letter, the Facebook page for the protest stated: “[PSSST] claim to want to have a dialogue with the community, but any such thing is only so that they can even FURTHER develop their spin. Some of us don’t want to give them such an opportunity. You don’t dialogue with those you want to see gone.” Although PSSST was not open, the police were called by a neighbor. Things got more complicated when it came out that one of the principal activists behind Pissst and Resisting was not a longstanding member of the Boyle Heights community, but a former classmate and friend of Gimbrone’s and Cohen’s from CalArts. Kean O’Brien describes themselves as a “fellow white queer/trans artist” (Gimbrone also identifies as transgender) who became critical of PSSST for what O’Brien saw as a lack of consideration for the community and “because of the blind spots Jules and Barnett had when allowing the investor to purchase a building in Boyle Heights,” according to a statement O’Brien emailed Hyperallergic. “I do not want to be a part of an art world where political work is made and put into white walled war zones (profit or non-profit) which are in service of racism, capitalism and white supremacy — this erases whatever intention the work had in the first place,” they continued. Perhaps ironically, it was precisely the progressive language used by PSSST that invited more scrutiny than other nearby for-profit galleries had received. “One of the critiques of PSSST was the contradiction between the language used to promote the space, and the actual impact that a space like this can have on the housing market, the development of the neighborhood, and life of a very low income community living in constant resistance against displacement; a community consistently ignored every time that someone ‘plans’ ‘improvements’ for them,” Leonardo Vilchis, co-director of Union de Vecinos told Hyperallergic via email. The question of whether the gallery is for profit or non-profit does not make a difference to us. Serious damage has been done in the community by non-profit institutions, foundations, public agencies, and private/public investment […] The issue for us is less a question of who is doing the damage, but what damage is being done. Maybe we should hold the well intentioned non-profits to a higher standard. L.A. Onda, a recently formed collective of “antiauthoritarian anticapitalists,” said that PSSST’s attempts at diversity were insufficient. 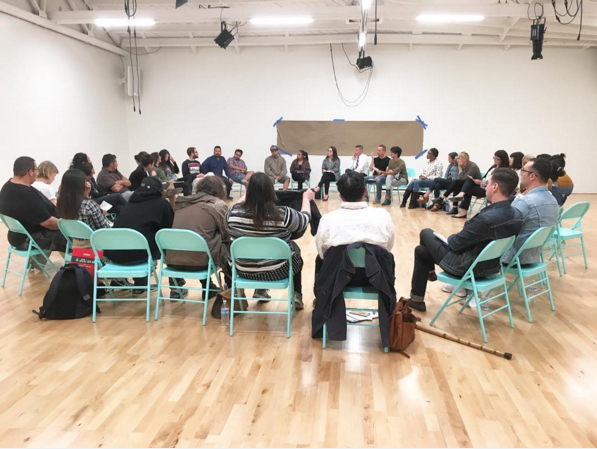 “They have all the right people of color backing them up, but the artists involved with PSSST fail to see beyond their utilitarian use of identity politics and realize that LA and its working-class residents no longer will be content with mere representation in a gallery or museum when it results in their literal displacement,” they told Hyperallergic via email. “It may serve the need of a few artists color blinded by careerism, but not much of anyone else.” The advisory board includes artist Njideka Akunyili Crosby, Hammer curator Jamillah James, and MOCA curator Lanka Tattersall — all women of color, as well as A.L. Steiner, a queer female artist. Adrian Rivas, a Latino independent curator who was born in Boyle Heights and grew up in nearby Montebello, is on the Board of Directors. PSSST has also selected Guadalupe Rosales — who was born in Boyle Heights and raised in East Los Angeles — as its first artist-in-residence. Rosales is well known for her popular Veteranas and Rucas and Map Pointz Instagram accounts featuring vintage images of SoCal Chicano/a youth culture. 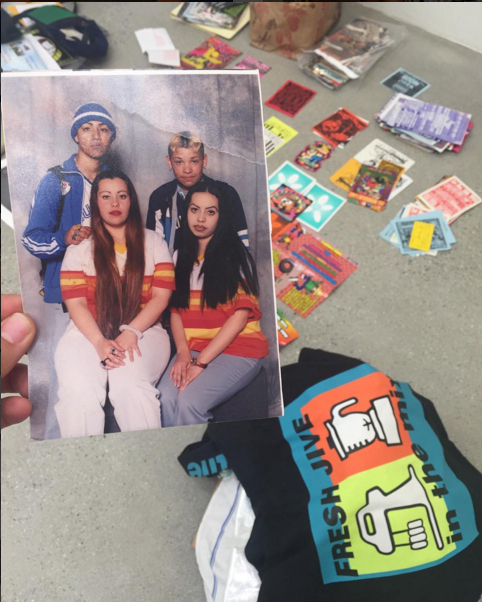 She will expand on this project for PSSST’s inaugural exhibition, Edges of Chaos, which will comprise performances, talks, and an archive of images and ephemera related to SoCal Latino party crews of the ’90s. “Coming in with predetermined ideas about what’s right for a place or for a people is frankly audacious,” followed Cohen. In keeping with this notion, PSSST held an open conversation on Tuesday, inviting members of the community to give input on what kind of programming they would like to see. A few dozen artists, educators, and youth were there, both from within and outside the Boyle Heights community, and the hostility that had been present a few weeks earlier was nowhere to be seen. Suggestions were given, but there also seemed to be the feeling that too much of the responsibility was being put on community members to come up with ways to welcome PSSST to the area. “I was super-intimidated to come here,” said a young artist who had recently curated a show at Self-Help Graphics, as she looked around at the space’s gleaming white walls and polished wood floors. “What would you do to make us more comfortable?” she asked. Artist Nao Bustamante, who was named Vice Dean of Art at the USC Roski School of Art and Design in January, cautioned Cohen and Gimbrone against trying to be everything to everybody. Even with community input, they’re going to have to make hard decisions about which programming avenues to pursue. Edges of Chaos: Promoting Madness and Dissent in the 90’s opens with a conversation and video screening on Friday, June 3, 7–10pm at PSSST (1329 E 3rd Street, Boyle Heights, Los Angeles).